NEW VERSION2 - EVEN BETTER AND MORE DURABLE - NEW UPDATED CONTROLLER & MOUNTING BRACKET INCLUDED! Selfsat Snipe Version 2 Twin fully automatic flat satellite antenna - The compact construction of the Selfsat Snipe 2 Twin takes up very little space. It is ideal for mounting on the roof of a caravan or motor home. The annoying hassle of aligning in a new location is obliterated thanks to the integrated GPS module and electronically controlled drive which determines the correct position automatically at the touch of a button. Despite its small size the Selfsat Snipe 2 Twin provides good reception due to its three-layer structure with wave guide horn array function. Horizontally and vertically polarized signals are routed separately and bundled on the LNB. The result: A strong signal to the LNB. 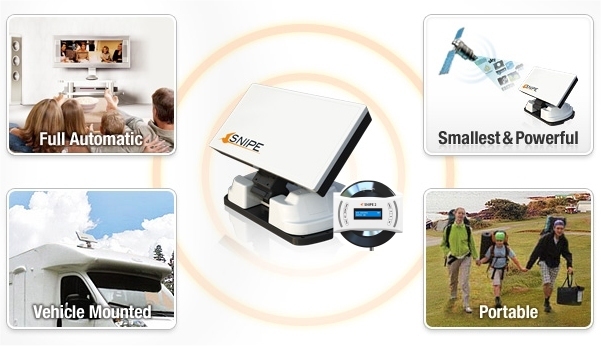 The Selfsat Snipe 2 Twin can be used with most satellites over Europe such as Astra, Eutelsat, Hotbird and worldwide. This particular model has two LNB outputs on the reverse of the antenna for feeding either two set top boxes or PVR recevier such as a Sky+HD box. 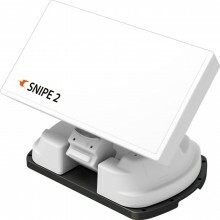 The Selfsat Snipe 2 Twin offers fully automatic positioning. With its built-in GPS receiver the GPS data is collected and evaluated. The exact position of the antenna is automatically calculated resulting in quick and highly efficient alignment. just purchased a swift challenger 560 caravan and had the snipe2 fitted I cannot believe how good this kit is . I push one button then HD TV every channel even in very heavy rainfall perfect picture on both TV's worth every penny . PURCHASED THIS SYSTEM TO FEED A HUMAX 1100S, WHICH IN TURN THROUGH THE AUDIO VIDEO LINK FROM THE REAR OF THE HUMAX FED 4 TELEVISIONS LINKED TO AN ALPINE DIGITAL TV SYSTEM. Click the button below to add the Selfsat Snipe v2 Twin LNB Automatic Flat Satellite Antenna inc Mount to your wish list.